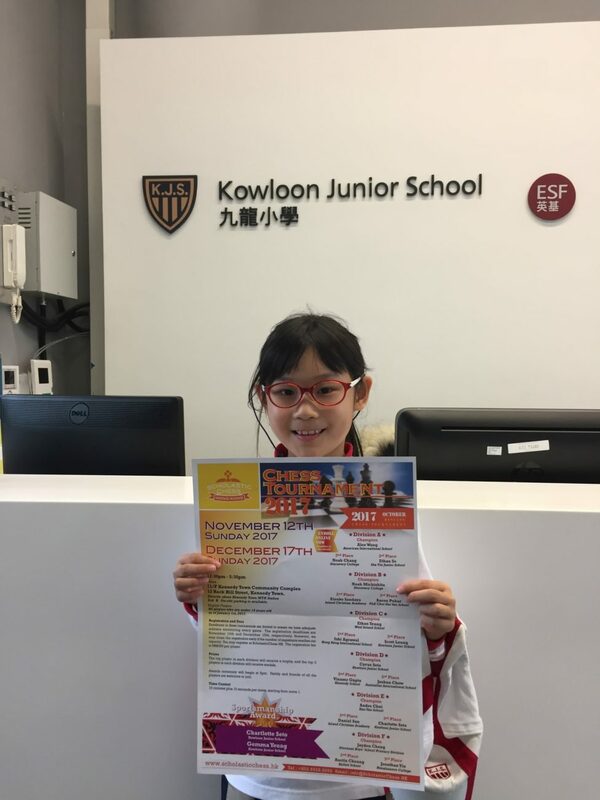 Kowloon Junior School’s latest newsletter is available to read now. Last week I encouraged you to look at, and discuss the Learner Profile and to consider how you might encourage your child/children to be more self managing or have more ‘agency.’ Agency is an very important KJS and IB / PYP characteristic. It is the notion of children progressively taking more responsibility for their learning, behaviours and relationships. It suggests that children do not need (nor is it desirable) to be dependent on teachers telling them what to do, when and how to do it and solely reliant on the teacher’s opinion of their learning. Furthermore, one of the most significant factors in improving student achievement is ‘self reported grades’. Asking a child to predict how they think they can achieve and then stretching them even further has significant benefits for our children, try it at home! To give you a very practical example this might be creating a success criteria (such as a checklist) for what your child needs to do in the morning to be ready for school (eg: get up, make bed, wash, change, eat breakfast, brush teeth, pack bag… all by a set time) or what they need to do in the evenings before bedtime. Ask your child to predict how long it will take or what they will do best and then challenge them to do it better or faster! The more we can build agency in our children the better chance they will have of being successful as a family member, friend, team member and KJS student. Once again this week I have been at camp, this time with the year six children. It was heartwarming to see them not only get themselves sorted for the day, and also to witness the care and compassion they had for one another when facing challenges throughout the day. I am extremely thankful to the KJS team for the time, effort and sacrifice of family time they have contributed to make the camping experiences such a success. As the evening at camp drew to a close on Tuesday I was treated to a lovely experience as three girls taught me some basic Hindi as I seek to develop my international mindedness. We have such caring and considerate children at KJS! Take the time to jump on our school Facebook page if you would like to see some of the photos of children in action at camp! Year 3 – Wednesday 13th, 9am – 11am. Year 4 – Wednesday 13th, 12pm – 2pm. Children should come to school wearing their P.E. kit and school hat. Please make sure your child brings a named water bottle and an easy to eat snack for Sports Day. All parents are invited to come along and watch their children take part in this fun event. 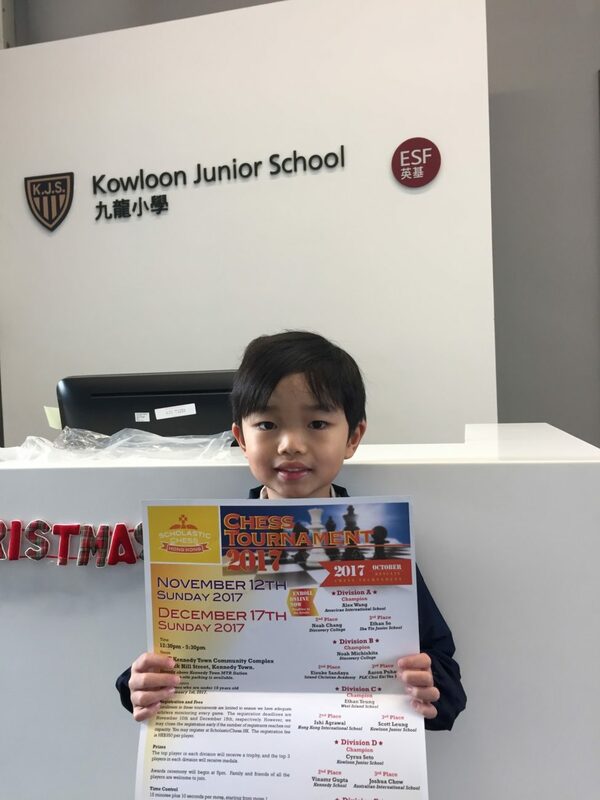 The school likes to use this event to promote the house system and it would be great if parents could help by wearing the colour of their own child’s house team. Please note that it will be a normal school day after Sports Day with all children going home at 2.45pm as usual. Please register through this link to RSVP for the special farewell afternoon tea for Ms Karen Thomas. Please check Gateway (Activities) to register for clubs next term. Registration will be open from tomorrow (7 Dec) at 4pm. Information regarding PE and Music Clubs will be shared in due course. We will be hosting a farewell tea for Karen Thomas on Tuesday 12 December 2017. Please do let us know if you can make it. It would help us with the arrangement of the refreshments. 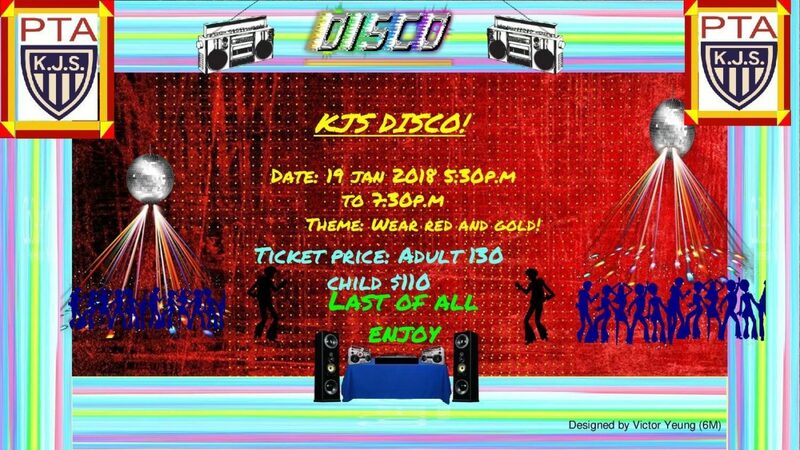 Tickets for our School Disco, which will take place on Friday 19 January 2018, are on sale now at the PTA Office. Kindly fill in the form here and let us know how many tickets you would need and if you could help out on the night. Preparations for the school fair, which will take place on Saturday 17 March 2018, are well underway. We have received some amazing donations from parents – thank you so much. We really appreciate your help and support. We are still collecting items for our school auction and our White Elephant stall. If you would like to contribute to these, please do approach the PTA office and let us know. Kindly note that we cannot accept items that are old or damaged. All proceeds from the School Fair will be donated to the school to develop Secret Gardens around the school to raise awareness of our natural environment and to create a platform where students, parents and teachers can work together. We really appreciate all the help we can get. We are also looking for lots of volunteers for this event. If you can help, please do let us know. 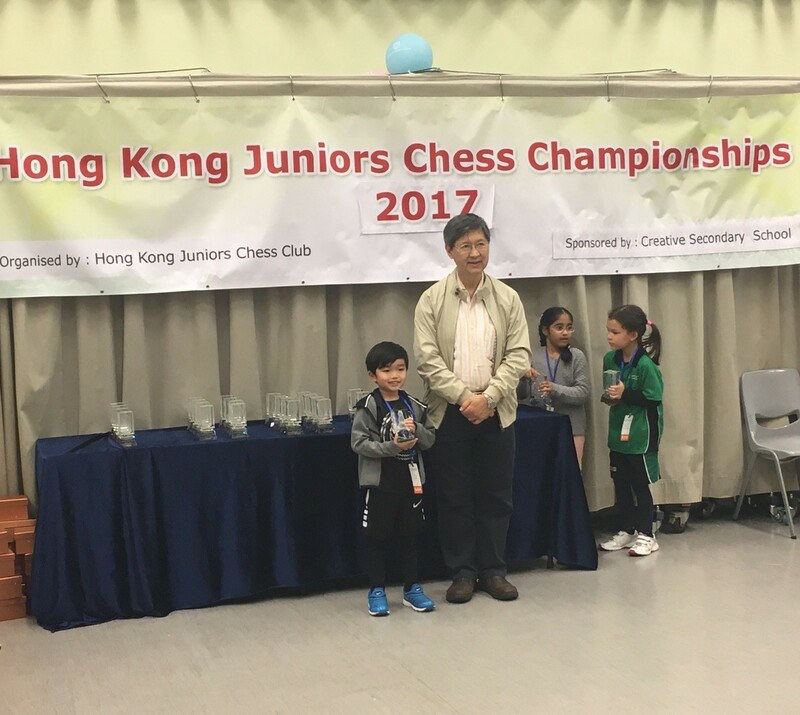 Cyrus (3C) joined Hong Kong Junior Chess Championship which is one of the biggest and most competitive individual chess tournaments held every year. 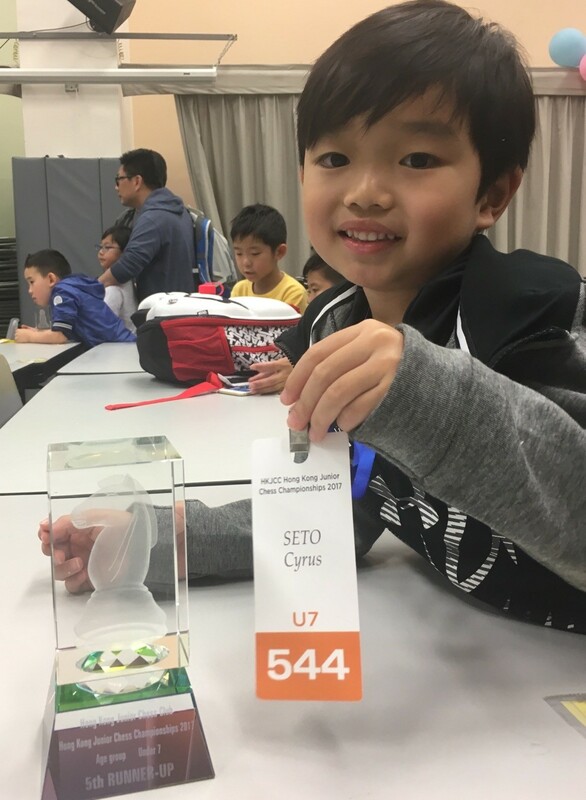 Cyrus got 5th runner-up among 60 kids in his group U7. Well done, Cyrus! 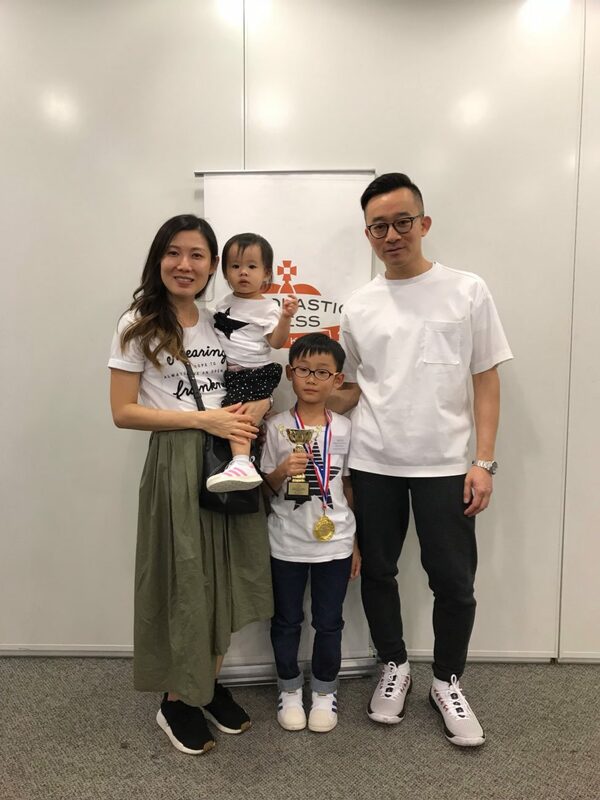 Sophia (3G) performed at the 10th Hong Kong Students Open Music Competition. 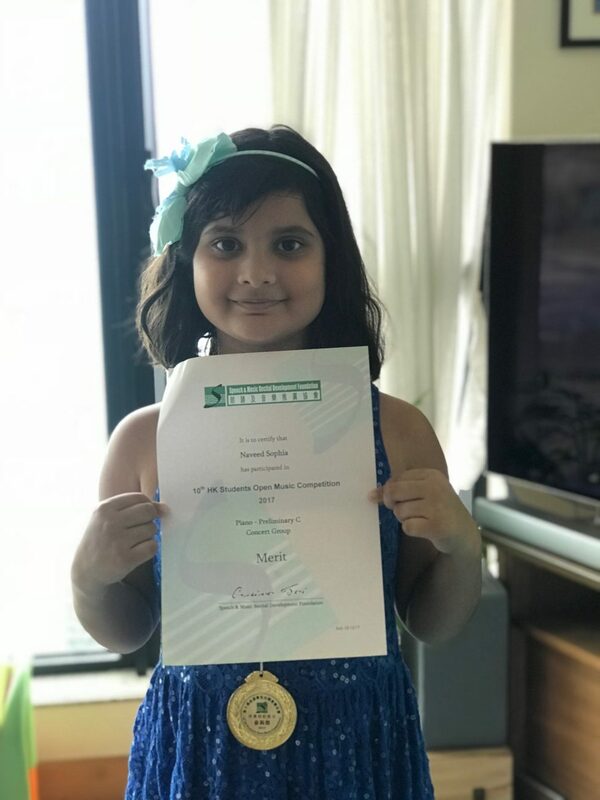 She received a merit certificate for the competition. Congratulations Sophia! 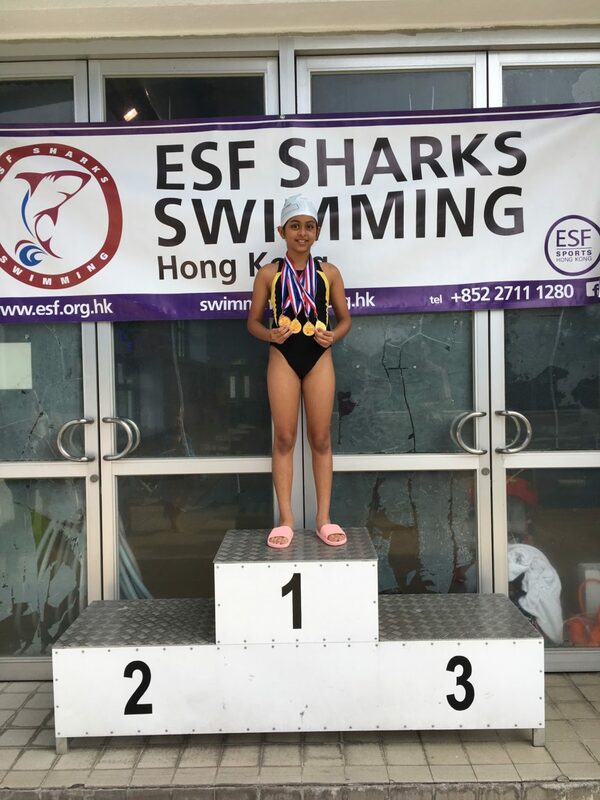 Tulip (5H) participated in 17th Annual Swimming Gala (ESF Shark Swimming) on Saturday at South Island School. 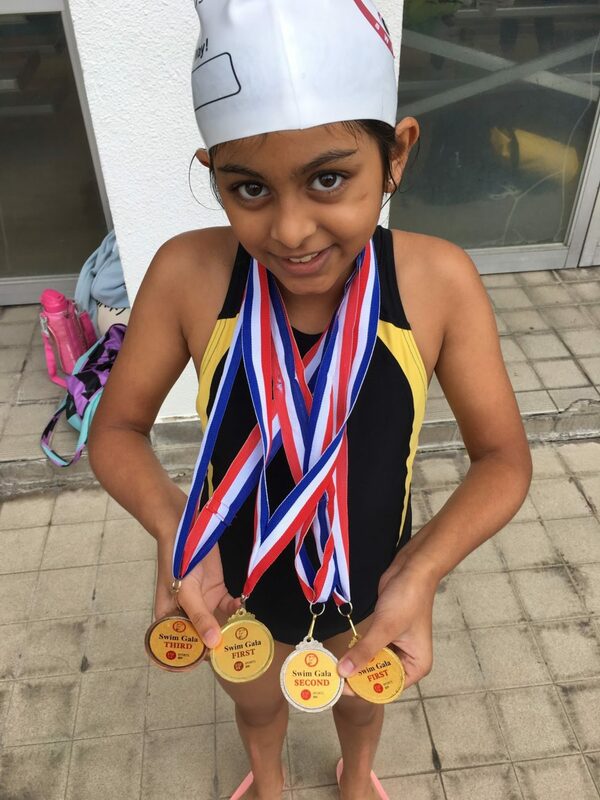 She participated in four swimming races and was first (free style ,25 m), first (butterfly 25 m), second (backstroke 25 m), and third (breast stroke 25 m) place. Tulip would like to share this with the KJS community. Congratulations Tulip! 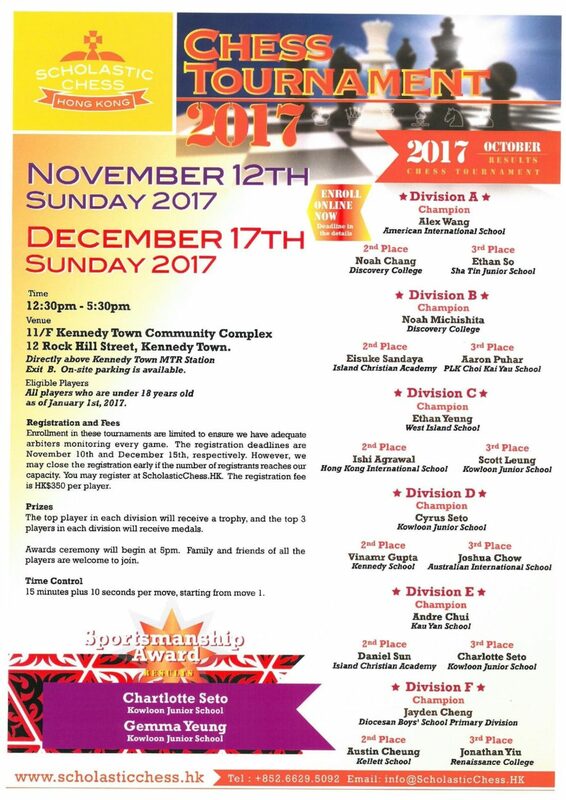 A group of KJS students participated in the Scholastic Chess Tournament. 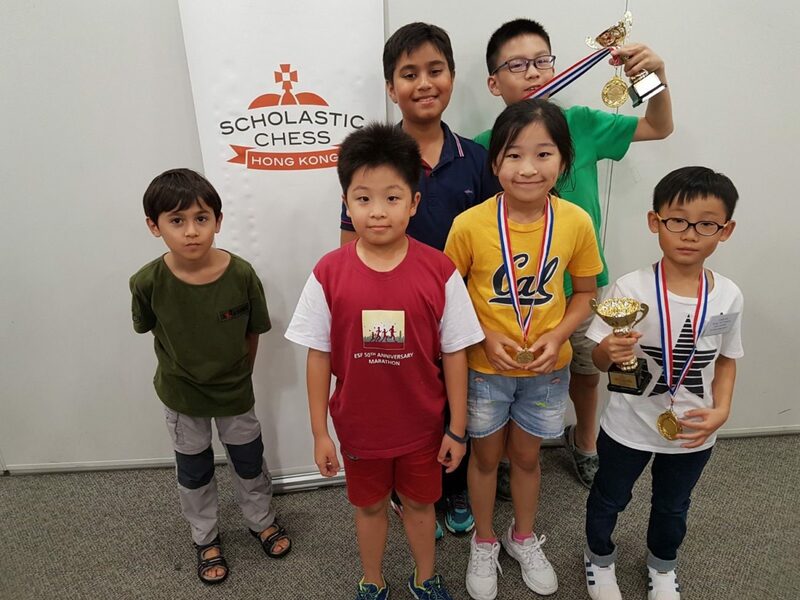 They are Rahul (6A), Scott (6M), Charlotte (5M), Sian (5D), Yi-Chen (5S), Sebastian (4R), Cyrus (3C), Gemma (3G), and Quinton (3C). They would like to share their achievements with the KJS community! 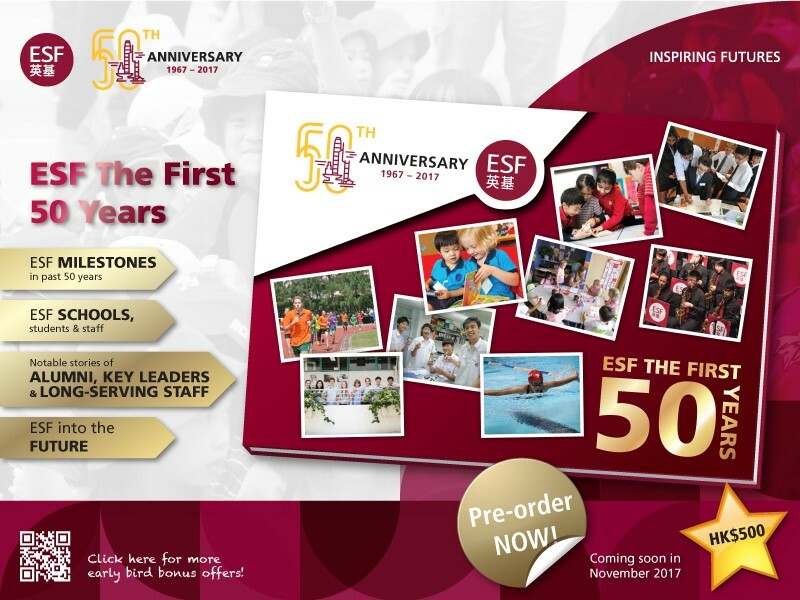 To mark ESF’s half-century, we are publishing a commemorative book: ESF The First 50 Years. This volume will chronicle the ESF story, highlighting key events over the last 50 years. It will also celebrate the successes and contributions of our students and staff, both past and current. 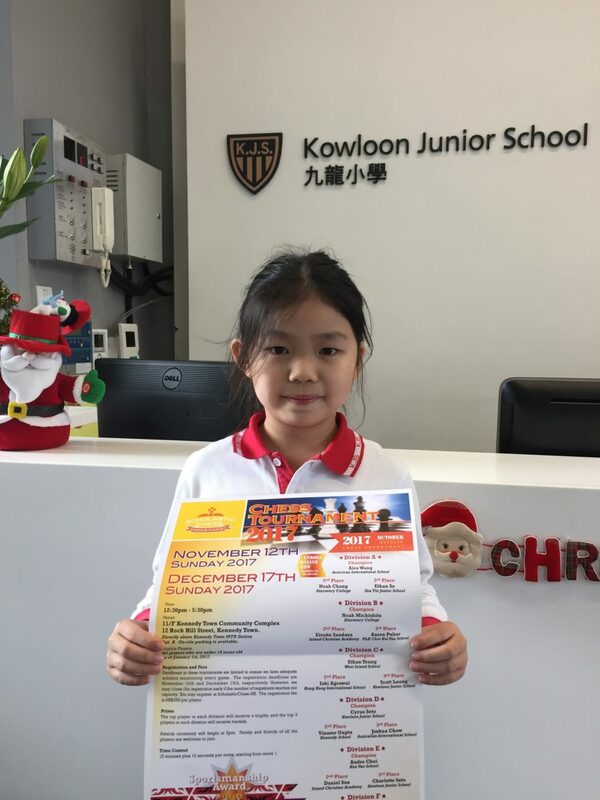 Kowloon Junior School, English Schools Foundation and its affiliates shall take no responsibility for any activities, events and services that are organised by other organisations or individuals and are mentioned in our newsletters..